The Air Jordan 9 Retro “Bin 23″, Jordan Brand’s second offering from its high-end Bin 23 Collection, is set to release this Saturday, June 5th, 2010 for $175. We now have additional release details in regards to this highly anticipated sneaker. Much like the Air Jordan 2 Premio “Bin 23″, this particular sneaker will be released in limited quantity (1,331); however, House of Hoops is one of the few retailers that will have this shoe available in stock. 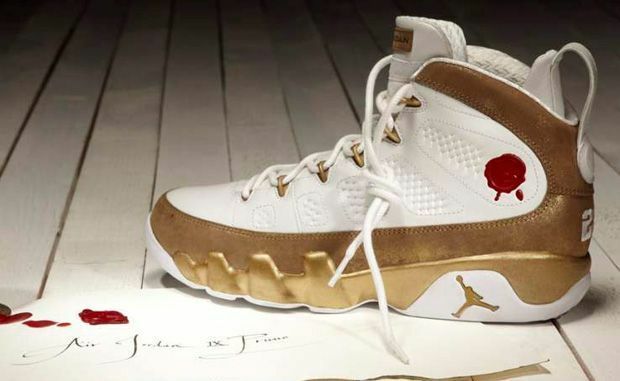 As for its design attributes, this Air Jordan 9 combined white premium leather and gold, glossy nubuck on the base while also incorporating the red Bin 23 stamp on the lateral side. It is finished with a gold midsole and a white outsole with Jordan branding appearing on the tongue, insole, heel among other places. Lastly, this limited sneaker will come in a nice sneaker bag along with some highly-detailed shoe trees.